Nowadays when you are looking for Big Data techniques you get in touch with Hadoop. If you are googling for an In-Memory Database you will find SAP HANA. These are two actual topics which are on top of the Gartner Hype Cycle of Emerging Technologies (Gartner, 2014). That’s one of the reason why we from IT-Logix wanted to create a test environment which all of our consultants can access easily. But technologies like SAP HANA needs lots of HDD space, let alone of memory. The minimum memory requirement even just for testing SAP HANA is 24 GB (SAP, 2014). As we don’t need a production system which is always up and running we were looking for a cheaper solution compared to buying new hardware and host the new test system on premise. Cloudshare provides us exactly what we were looking for: A flexible platform to host virtual machines at a very low cost due to the fact that the systems get suspended after a certain period of user inactivity. We already used the Cloudshare offering “ProPlus” to host the SAP BusinessObjects BI platform (see Raphael’s blog here: http://rbranger.wordpress.com/2012/04/30/testing-bo-bi-4-x-using-the-cloud/ ) Within CloudShare Pro the maximum memory per virtual machine is limited to 16GB. 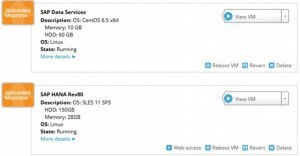 Further we need to install operating systems like SUSE Linux Enterprise Server 11 or Red Hat 6.5 which are not available as preconfigured templates.. All these requirements and even more will easily be covered by CloudShare Team Labs, so we decided to use this for our new test environment. Let’s start configuring the Environment. Hortonworks Hadoop is a preconfigured virtual machine which you can download 100% free. Besides the Apache Hadoop Database it includes numerous tools for data management, data access, data governance & integration, security and operations. A perfect system to learn and test Apache Hadoop. SAP Data Services is a really powerful ETL tool. To work with this tool you’ll need also SAP IPS or BusinessObjects. You need a SAP Partner Agreement or customer contract to download it from the SAP Service Marketplace. To install and configure SAP Data Services on CloudShare Team Labs we decided to first install it on our local system or e.g. on a VMWare ESXi Server. This way we are free to choose our own operating system and configure it from scratch. In our case we are working with VMWare Workspace. Once we are finished, we’ll export the virtual machine and follow again the instructions for uploading your own image to CloudShare (Link). SAP Data Services can be installed on Red Hat 6.5 or CentOS 6.5 with a little hack (and of course other operating systems, but in this case we wanted to play around with the Red Hat version) . We’ll show you both alternatives. 2. Create a new VM within VMWare Workstation and load the downloaded Image of the OS. HANA is new a database technology of SAP. It uses In-Memory-Technology which is significantly faster compared to legacy disk based databases. To install and configure it on CloudShare Team Labs we recommend to configure the operating system locally, then upload the VM to the CloudShare Environment and install SAP HANA directly on the system in Cloudshare. The reason for this procedure is that our local systems don’t have 24GB of free memory to install HANA. Moreover, it takes much more time to upload an image which is about 15GB. The newest HANA revision 80 supports also Red Hat beside SLES. But we decided to use SLES because there isn’t much experience with HANA on Red Hat right now. Note: If you are using SLES 11 SP2 you need to install gcc47-runtime manually. Before we can install SAP HANA on the just uploaded SLES OS, we need to configure the network. Prior to that we cannot download the HANA Setup. After configuring the root node, select the other VMs and assign them to the Subnet. If you like to work to work with our local installation of SAP HANA Studio, you have to select Public IP to make your VM accessible from outside the Cloud. For SAP HANA you need to open Port 30015 in order to connect with your local SAP HANA Studio. Port 8000 is for the XS Engine and Port 22 is SSH. Note: Not all ports could be opened. Due to security reasons, CloudShare only allow some ports to open e.g. 22, 80, 443, 8000, 8080, 30015. All ports which are not entered here, are closed – so you don’t need a necessary a firewall on the OS. 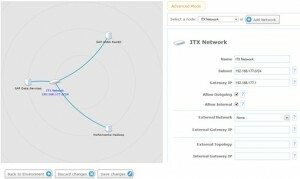 When you assigned all VMs to the network we need to configure the network cards of the VMs. Repeat this steps for the other two VMs and you’re done with the network configuration. 2. Follow the setup wizard.